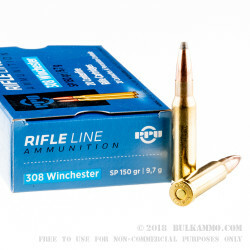 These soft point .308 Winchester rounds are a prime choice for hunting stomach-filling deer, clearing a field of pesky feral hogs, or just plinking around with your favorite battle rifle. This ammo is made by Prvi Partizan, a Serbian country that is recognized for their ability to manufacture ammunition to NATO standards as well as for their preservation of older calibers that can only be fired from rare curio & relic firearms. 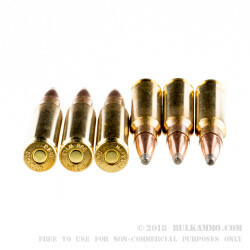 As such, this ammunition is made using the finest in modern components including non-caustic Boxer primers that are free of bore-corroding substances. 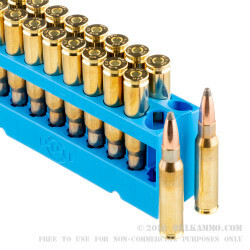 Each primer is fitted to the base of a reloadable brass casing. Prvi tops off the load with a traditional soft point: a lead bullet with an all-encompassing copper jacket and an exposed lead tip. This construction lends itself to gradual expansion with the apex of diameter increase occurring after the round has moved past thick layers of fat and bone. As a result, the round will deliver devastating terminal energy to the heart and lungs of a game animal without losing its momentum prematurely. A projectile weight of 150 grains matches the mid-range of .308 caliber loads and offers a nice balance between felt recoil, flat-shooting characteristics, and lethal impact velocity.